TPCS, which stands for Two-Phase Capillary Systems, is an EcosimPro toolkit for the simulation of Loop Heat Pipes (LHP) and Capillary Pumped Loops (CPL). 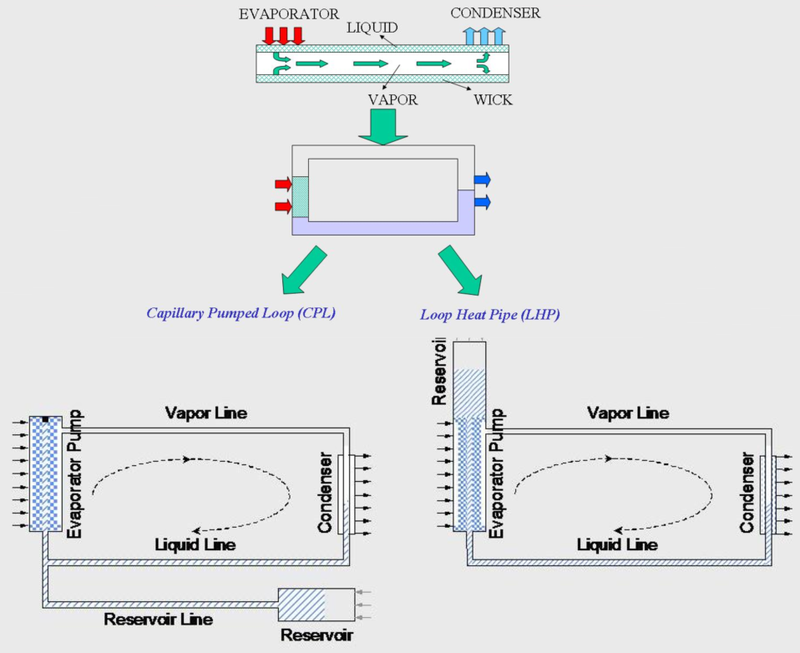 The operating principle of a TPCS heat transfer device is based on the evaporation and condensation of a working fluid, which uses the capillary pumping forces to ensure the fluid circulation. Models using TPCS toolkit calculates the transient response of a thermo-fluid system in correspondence with the boundaries and geometry defined in the model. Steady conditions can be calculated after a transient simulation under constant boundary conditions. On the other hand, sensitivity studies of geometry and design parameters can be easily done using the EcosimPro Monitor tool. The TPCS toolkit provides a large palette of components (represented by icons) to be inserted (drag and drop) in a model. There is no limitation concerning the system topology to be modelled; on the contrary, building a model is easily done by inserting the respective components as they are integrated in a real system. 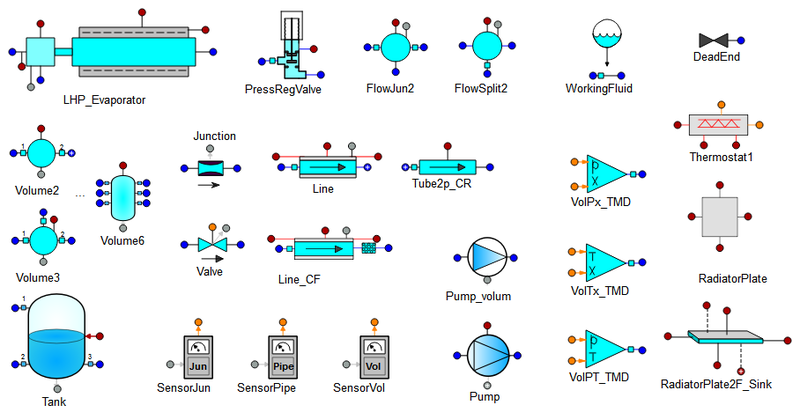 TPCS toolkit simulates fluid networks and equipment improving the numerical schemes classically used in other codes, dealing in particular with 1D pipe wall friction and two-phase flow at porous media. TPCS components have been validated against test results under liquid, gas or two-phase conditions depending on the current P/T conditions of the working fluid, the fluid phase being determined by the code. 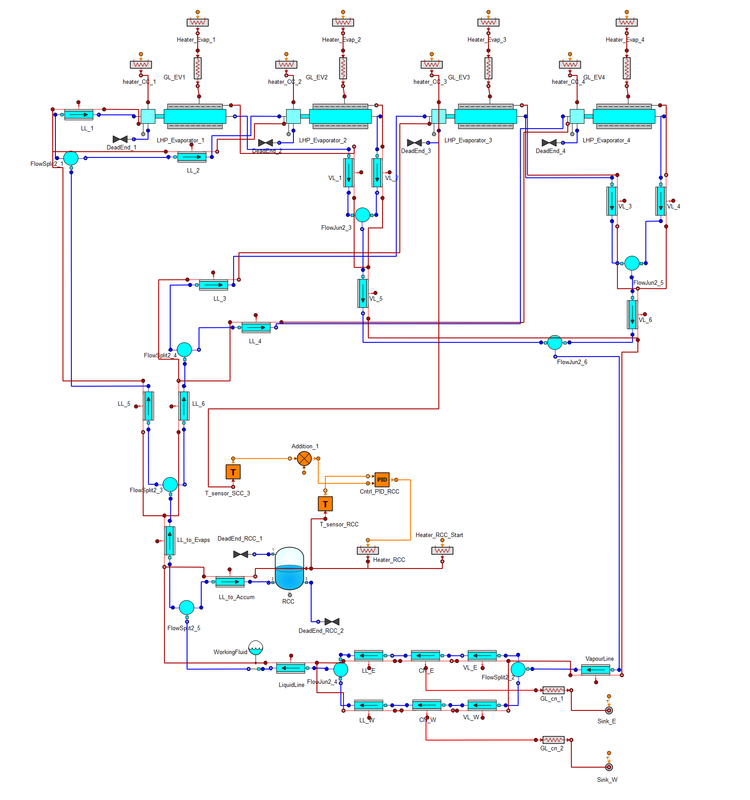 Complex topologies of loop heat pipes with one or more evaporator and/or pumping systems, where the heat transfer and the system controls are coupled, can be evaluated with this library just by linking graphically the concerned components in a particular system model. Typical LHP applications are: Space applications, Avionics cooling, Airplane anti-icing system for the engine cowl using waste semiconductor engine heat, etc. 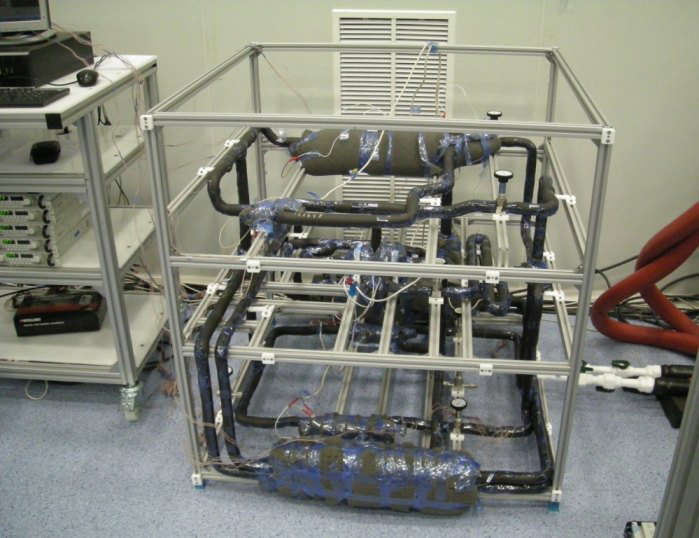 The image below shows a multi-evaporator, multi-condenser design (MER-LHP) developed by IberEspacio. MER-LHP was developed as a demonstrator of the multi-evaporator and multi-condenser concept, enabling high flexibility in terms of heat collection at different sources and at different heat load levels due to its multi-evaporator architecture. The capability of adding several condensers allows to create enhanced radiator layouts in typical configuration such as North/South and East/West, shared within the same system. 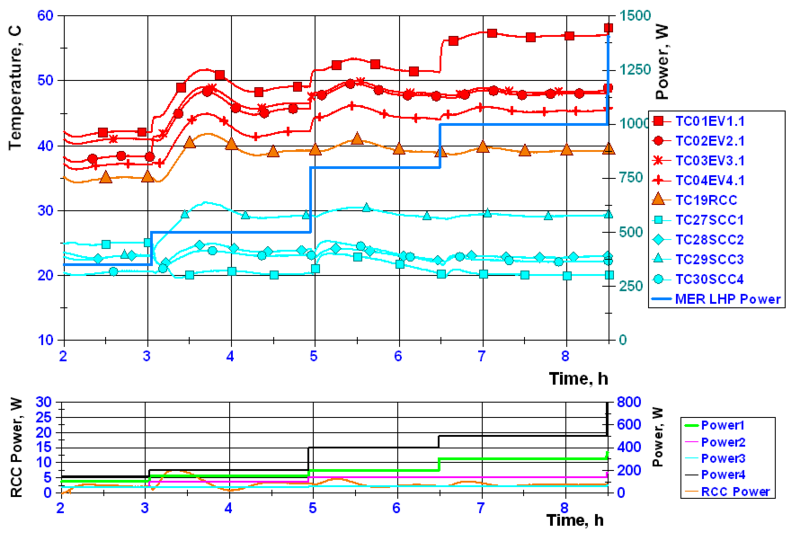 Thermal model results are stable and the different steady state scenarios are reached. 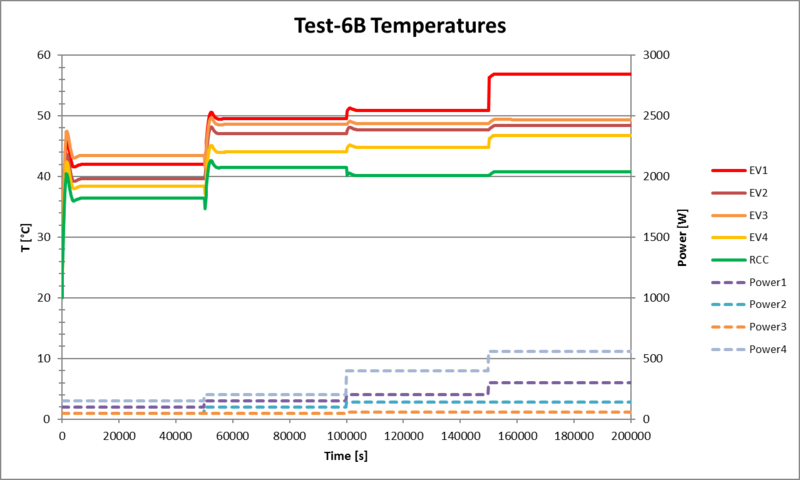 Steady state temperatures correspond to those obtained from hardware with minor error. Evaporators’ temperatures vary between 37°C to 57°C for the power sequence whereas the remote compensation chamber is maintained around 40°C.